Rydym yn galw ar Gynulliad Cenedlaethol Cymru i annog Llywodraeth Cynulliad Cymru i dynnu nôl yn ffurfiol o’r strategaeth is-ranbarthol Gorllewin Caer – Gogledd-ddwyrain Cymru. • Cynaladwyedd cymdeithasol (yn nhermau demograffeg, economeg, gwleidyddiaeth a chymunedau). Does dim ymgynghoriad o gwbl wedi bod â phobl Gogledd Cymru a dim ymgynghoriad go iawn gyda’n cynrychiolwyr etholedig ar level lleol a chenedlaethol. Yn sicr does dim mandad go iawn i’r cynllun. Nid yw’r cynllun yn statudol ond mae wedi dod yn statudol wrth gael ei fabwysiadu fel rhan o gynlluniau datblygu lleol a Chynllun Gofodol Cymru. Mae’r ffordd y mae’r cynllun wedi ei fabwysiadu wedi codi problemau sylfaenol mewn llywodraeth leol a chenedlaethol. Mae wedi dangos diffyg cynhwysedd a chlaerdeb, diffyg democratiaeth, adnabyddiaeth dewisiol o bolisi, atgyfnerthu ystrydebau ac hyrwyddo diwylliant o ffafriaeth. Mae amrediad eang y strategaeth yn golygu na fyddai tynnu nôl o’r cynllun ar y funud yn ateb llawer o’r materion sy’n ein pryderu ynglyn â’r cynllun a’r meddylfryd y tu cefn iddo. Rydym yn datgan fod strategaeth is-ranbarthol Gorllewin Caer/Gogledd-ddwyrain Cymru nid yn unig yn tanseilio Cytundeb Cymru’n Un ond hefyd rôl y Cynulliad Cenedlaethol ei hun. Felly, rydym yn deisebu’r Cynulliad ar ran pobl Gogledd Cymru er mwyn sefydlu corff/pwyllgor i drafod y pryderon yma gyda Phwyllgor Pobl Gogledd Cymru. Gofynnwn i’r Cynulliad ystyried ein tystiolaeth, ein barn a’n hymchwil gyda’r bwriad o dynnu o’r strategaeth er mwyn rhoi stop ar y niwed mae’n creu a symud ymlaen gyda datblygiadau positif yn unol â Chytundeb Cymru’n Un. Withdraw from the West Cheshire / North East Wales sub-regional strategy. We call upon the National Assembly for Wales to urge the Welsh Government to formally withdraw from the West Cheshire/North East Wales sub-regional strategy. • Societal sustainability (in terms of demographics, economics, politics and communities). There has been no consultation with the people of North Wales and very limited consultation with our elected representatives, at both a local and National level, there has certainly been no genuine mandate. The plan is non- statutory but has become statutory as it has been adopted in Local Development plans and the Wales Spatial plan. The way in which the plan has been adopted has highlighted significant problems in both local and national government. It has shown a lack of inclusion and transparency, lack of democracy, selective recognition of policy, a reinforcing of stereotypes and the promotion of a culture of discrimination. The range of implications of this strategy mean that simply withdrawing from the plan at this stage would not address the many issues that concern us about this strategy and the thinking behind it. We declare that the West Cheshire sub regional strategy not only undermines the One Wales agreement but also undermines the role of the Welsh Assembly itself. We therefore petition the Assembly on behalf of the people of North Wales, to set up a body/committee to discuss these concerns with the People’s Council of North Wales. We ask the Assembly to consider our evidence, views and research, with a view to withdrawing from the strategy in order to halt the damage being done, and to move forward with positive developments in line with the One Wales agreement. To enable members to consider the petition submitted by Cyngor Pobl Gogledd Cymru / The People’s Council of North Wales. 2.1 The West Cheshire/North East Wales sub regional strategy was formally adopted by Wrexham, Denbighshire and Flintshire councils, along with the Welsh Assembly Government in 2006. The strategy spans the period 2006 – 2021. 2.2 The strategies main aim was the creation of a new sub-region between North East Wales and the North West of England. It sets out policies on cross border working, covering issues such as housing, transport, employment, economic development, tourism and leisure. 2.3 It is the view of The People’s Council of North Wales, along with over 15,000 people, that the Welsh Assembly Government should formally withdraw from the West Cheshire North East Wales sub-regional strategy. This view is based on the damage being caused across North East Wales, both by the strategy itself and the Welsh planning system. It is our view that a culture of discrimination has been allowed to develop over recent decades, and further more that this culture is now firmly embedded in our governmental processes. The result is potentially irreversible damage to our quality of life in North East Wales, in terms of Welsh identity, Welsh language, the environment and our communities. 3.1 That the Welsh Assembly Government formally withdraw from the West Cheshire/ North East Wales sub-regional strategy. 3.2 That the Welsh Assembly Government further our research into the wide ranging social and environmental impacts of the West Cheshire plan and the use of population projections to predict future housing growth, and to make relevant and appropriate policy and actions to address these issues. i – Consider the research and views of the People’s Council of North Wales. ii- Discuss methods to halt the damage being done and to move forward with positive improvements in line with the One Wales Agreement. iii- That body/committee meetings be broadcast. To enable the Welsh Assembly Government to preserve and enhance Welsh identity and language in North East Wales. To repair damage done to the Welsh identity and language through inappropriate plans like the West Cheshire sub-regional strategy, and to enable Welsh people to attain a state of demographic sustainability. To repair the damage done to the level of trust between the people of North Wales and the Welsh Assembly Government. To prevent further environmental and social damage. To promote genuine equality, transparency and engagement with local people in the democratic process. Assembly Petition, total signatures collected in 3 months: 15,220. Members of Cyngor Pobl Gogledd Cymru: 236. 4.2 In July 2001, there was also reference to the desire for the creation of a new sub-region resulting from the public examination into North West Regional Planning Guidance. The panel recommended a “joint study by the authorities on either side of the border with a view to securing compatibility between policies in the interest of the sub-region as a whole”. This recommendation was accepted by the UK Government and the Leaders and Chief Executives of local authorities in West Cheshire and North East Wales, who subsequently agreed to support the principle of a sub-regional study. 4.3 Following various draft studies, the West Cheshire North East Wales sub- regional strategy was published in 2004 and subsequently adopted by authorities in England and Wales in 2006. 4.5 The West Cheshire sub-regional strategy is non statutory but is a material planning consideration in the preparation of Local Development Plans in Wrexham, Flintshire and Denbighshire. One of the plans main aims was to “ Create a distinct identity for the sub- region”. This was amended in later drafts to include the addition “ and to safeguard the distinctive characteristics within it”. 4.6 The plan identifies eleven ‘regeneration areas’ for the new sub-region where new development will be targeted. Nine of the regeneration areas are located in Wales. It promotes the idea of strategic mixed use sites, where new housing and employment developments will be located together. In addition to the above statements included within the Sustainability Appraisal accompanying the plan, there are also many other references relating to the environmental damage expected. c) Economically (i.e. economic performance, sustainable economic growth, marketing the sub-regions image). The ‘benefits’ to North East Wales are unclear. The Mersey Dee Alliance (MDA) is the organisation set up to implement the West Cheshire North East Wales sub-regional strategy. It was formed in 2007 and is made up of the local authorities of Cheshire West and Chester, Denbighshire, Ellesmere Port and Neston, Flintshire, Wirral, Wrexham, The Welsh Assembly government and Mersey Travel. The Partnership aims to work on strategic interests across the sub region including identifying development sites, transport and place marketing. The accountable body for the MDA is Cheshire County Council. Local authorities nominate 3 elected members to represent them on the board, the organisation is currently chaired by Wrexham Council leader Aled Roberts. Future household projections and population growth figures are currently provided to local authorities in Wales via Cardiff. These figures are intended to be represented in the Local Development Plans for each authority. Although WAG guidance states that local authorities can deviate from the figures should they be able to provide a sound evidence base, several Welsh authorities have clearly stated that they are being pressurised to use the higher growth rates put forward by WAG. Wrexham, Denbighshire and Conwy County Councils have all expressed the same concerns. Authorities have also expressed a fear to challenge the figures, due to the fact that their emerging LDP’s would likely be deemed ‘un sound’ by the Planning Inspectorate at deposit stage. to use these figures, there has been no scrutiny of the formula being used and there is no research available as regards the impacts. As an example, 50 % of the population projections for Wrexham are based on in migration trends. The remaining 50% are calculated on a ratio between birth and death rates, although issues such as affordability are not taken into account. The projections take a ‘snap shot’ of previous years growth and use this base to predict what levels of growth will be in future years. A flaw in this methodology is that growth is not based on local need, a period of extremely high growth and in migration can heavily skew the figures. This subsequently puts a demand on a local authority to plan for unnaturally high levels of development in their Local Development Plans. As an example, reports looking at housing growth in Wrexham have established that the authority has provided an over provision of housing and therefore encouraged further in migration into the county. In other words, rather than providing for local need and natural migration, the use of these figures has resulted in the creation of a housing market and un natural planned demographic change. The cost of preparing the initial sub-regional studies and West Cheshire plan were covered by the participating local Authorities, it is unknown at this stage to what extent the WAG have contributed financially to this process. Participating local authorities also make a financial contribution for their membership of the Mersey Dee Alliance. In addition to the use of this public money ,it is also believed that monies given to Wales via WEFO have also been used in line with cross border aims identified in both the sub-regional strategy and Wales Spatial Plan, we are yet to learn to what extent. There has been no consultation what so ever with the people of North East Wales about the adoption of the West Cheshire sub-regional strategy or about the three Welsh authorities involved becoming part of the new ‘sub- region. The only consultation to have taken place has been with ‘key stakeholders’. There are many documents listing in detail the aims and objectives of the West Cheshire sub-regional strategy and also the general ‘vision’ the Assembly has for North East Wales. In this conclusion we aim to outline what the effects of this vision have been in reality and the direct impact they have had on the local population in the North East. We feel justified to make these observations both due to various public documents confirming the situation and also as local people who are living through this process. One of the central issues in terms of negative impact is that of housing and the use of population projections to calculate future provision. During the period these figures have been used we have seen dramatic changes to both our landscape, our communities and our identity. We acknowledge that this process has been on going for many years prior to the adoption of the West Cheshire plan and view the strategy itself as the culmination of a succession of discriminatory policy. The strategy is significant in that it outlines in black and white a process of social engineering that has, over the years, become the ‘norm’ and part of our planning process. We have endeavoured to find research into the wide ranging social effects of employing such a policy but to date have found none. The un naturally high levels of in migration are acknowledged in several public documents but apart from the observed house price rises, other effects have not been monitored. To again use Wrexham as an example, over 6000 houses have been built in the county since 1996, a further 3000 are either under construction or have valid planning permission. An extremely small percentage of these have been affordable for local people, a total of 64 units or 1% of the over all figures. The vast majority of local people cannot afford to purchase general market housing. Where a large concentration of houses have been built, the local communities in those areas have been told the development is for the purpose of ‘regeneration’. In reality regeneration has meant re population, with the existing community experiencing no benefit at all. Inevitably the houses have, in the main, been purchased by those moving into the area with a financial advantage over the local population. The impact of this demographic change has been a dramatic increase in house prices in the local area. Additionally, many of those moving in are commuters, who very often spend the majority of both their working and leisure time in the North West of England. The effect of this change is a breakdown of community cohesion, with the numbers moving in being so large there is no opportunity for integration and instead the community splits. There is also a very tangible change to the identity of these villages, with welsh identity and language being continually eroded purely due to development. Even markers such as local accent are disappearing. To demonstrate this, the labour force survey (2001) looked at the amount of people in Wales who identified with being ‘Welsh’. In the North East the results of this survey are very disturbing. In Flintshire, those who identified with being Welsh showed a continual decline, with 2001 figures showing that only just over 40% identified with being Welsh. 2001 census figures for Flintshire also confirm that those born in Wales had decreased to the 50% mark, there can be no doubt that by the next census Welsh people in Flintshire will be a minority. The figures for Denbighshire show a similar story, with those identifying with being Welsh again under the 50% mark and those born in Wales at a similar level. The figures for Wrexham were a little more positive, with those identifying with being Welsh sitting at the 70% mark, again this more or less tallies with the amount of people listed as being born in Wales. However, in several wards in the county these levels drop below the 50% mark and unfortunately the figures generally also show a downward spiral. Given the amount of development in this County over recent years, there are serious concerns as regards what these figures will show in 2011. The above gives a picture spanning the North East counties and the impact of large scale development across the area. We feel it is fair to conclude that before too long, Welsh people will be a minority in North East Wales, as a direct result of Welsh planning policy. These changes have occurred over a relatively short period of time, natural migration is of course part of organic demographic change, however, what we have experienced in the North East is anything but natural. It has in fact been part of a planned process, seated in a governmental desire for further economic growth from both sides of the border. Of course, along with the negative impacts on Welsh identity come the negative impacts on the environment. We have seen huge traffic increases across the North East, with development promoting unsustainable commuting patterns and subsequently increases in carbon emissions. There is more pressure on service provision such as doctors, dentists and hospital waiting lists. There is also more pressure on fundamental provision such as water, with the environment agency warning areas like Wrexham that the supply cannot cope with the continuing rate of growth. With such an increase in population comes an increased demand for landfill space etc etc. All these impacts combine to have a direct impact on our quality of life. These impacts have not been researched or studied, yet our local authorities and the Assembly Government are committed to furthering this process to yet more devastating levels. We view this attitude as completely irresponsible, especially because the small amount of evidence that is available clearly states that these will be the effects of strategies such as the West Cheshire Plan. Both the Wales Spatial Plan and the West Cheshire sub-regional strategy place further economic development as a key priority for North East Wales. This development will be focused on the strategic centres identified in the plan and also via mixed use housing and economic development targeted at the regeneration areas. The implications of such development on welsh culture, language and identity have already been discussed previously and are outlined in detail in the Sustainability Appraisal which accompanies the plan. The One Wales Agreement clearly states that transport links between North and South Wales will be strengthened. 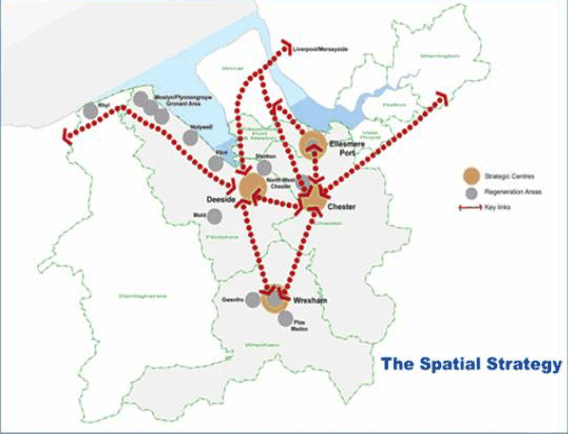 The West Cheshire sub-regional strategy and Wales Spatial Plan outline a completely contradictory aim, with transport improvements planned between the North West of England and North East Wales. The links that they are attempting to create are artificial but there is a clear agenda behind this thinking. In order to market places like Wrexham as a retail centre and as a ‘Cheshire location’ for potential new residents and those who want to set up business, the sub regional strategy and the Mersey Dee Alliance have identified a need to change perceptions of North East Wales. This change of perception essentially revolves around reinventing the image of strategic sites identified in the plan (Wrexham being one and the example we will discuss here). In November 2008, Wrexham Councillors were presented with a branding project, commissioned by their economic development department and undertaken by a consultancy firm called ‘Thinking Place’. The aim of the branding exercise was to import businesses and people into Wrexham from the North West of England, rather than to create business opportunities for local people or to even address local needs. The tag lines to front the strategy were ‘no borders’ and ‘no compromise’. The strategy proposed changing the identity of Wrexham in order to make it more acceptable for investment by a middle class business culture. In the presentation Thinking Place state that “Wrexham could be either English or Welsh, it is sometimes Welsh, sometimes English“. As stated earlier, one of the key tag lines for the strategy was ‘no borders’. Thinking Place go on to explain the reasoning for their choice “No borders – about our nationality, our geography, our reach’. Point 5.4 is an example of how the West Cheshire Plan is being implemented on local level and clearly shows the discriminatory way of thinking behind the entire plan. Although subsequently scrapped due to objections by local Councillors, the ‘branding’ exercise in Wrexham cost £26,000 of public money. (e)Any form of propaganda designed to promote or incite racial or ethnic discrimination directed against them. 1.Indigenous peoples have the right to the lands, territories and resources which they have traditionally owned, occupied or otherwise used or acquired. 5.6 It is an accepted part of Human Rights legislation that individuals have a right to their national identity, language and culture. The Convention on the Rights of the Child also includes express protections of the rights of indigenous children to their own cultures, religions and languages. It is the view of The Peoples Council of North Wales that these basic Human Rights are clearly being breached through the adoption of the West Cheshire sub-regional strategy and the use of population projections by the Welsh Assembly Government and local authorities in North East Wales. It is also our view that strategies such as the West Cheshire Plan directly undermine our Welsh Assembly Government, in terms of setting a precedent as regards ‘fuzzy boundaries’ in relation to jurisdiction over Welsh planning policy. We the Peoples Council of North Wales are following the democratic due process. Members of our committee have followed these processes in the recent past with campaigns associated with the sub-regional strategy. The experience has left a deep rooted and high level of dis trust of the democratic process, within local and national government. In going through this process via the petitions committee, in good faith, we appeal to our Assembly to address the concerns of the people of North Wales. In essence, we appeal to the Assembly to re focus its attention onto the needs and aspirations of our Nation.